We will create a new improvised format every single class! 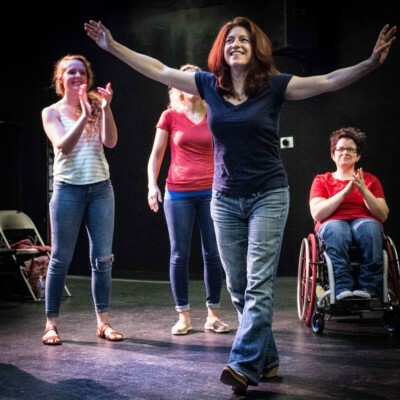 Based on the students’ improv experience and preferences, as well as an idea we will draw out of a hat, the director/instructor will lead the ensemble of students in exercises that move into a brand new mid-form or long-form improvisation each week. Students can sign up for just one class, the whole session of classes, or any number in between. I have a bit of a hard time getting out of my own head at times, so starting scenes and supporting my scene partners in long form sets can be challenging. Amanda's 'Build a Form' class had us doing long form acts where not only was it easy to transition and start new scenes, but also carry on the stories because we were all so focused on supporting each other. Anyone looking to improve on their long form skills would love the challenge of that class. Build a Form is incredibly fun! Amanda took suggestions and helped us create a new form. As we had fun practicing it, Amanda guided our experimentation of the new form into unexpected and exciting directions. Amanda has so much skill, talent and super duper cool awesome energy, and I am really grateful I took this workshop.